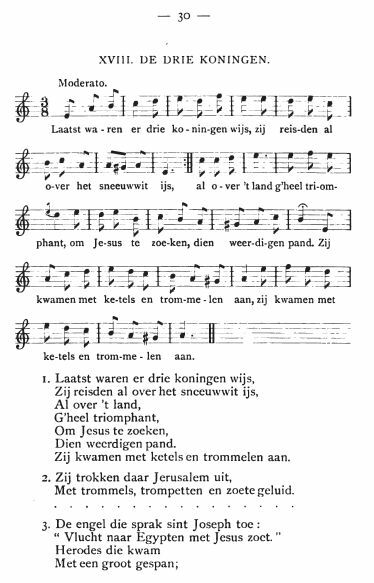 Source: Adolphe Richard Lootens, Jean Marie Eusèbe Feys, eds., Chants populaires flamands: avec les airs notés, et poesies populaires diverses (Desclée, De Brouwer & Cie, 1879), #18, pp. 30-31. Zij kwamen met ketels en trommelen aan. "Vlucht naar Egypten met Jesus zoet,"
Sint Joseph die troostte z'in hare droefheidl. 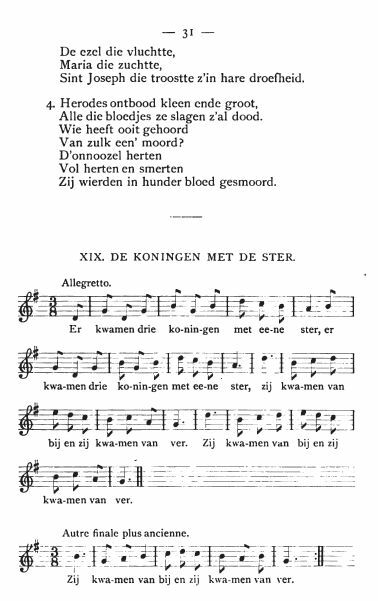 Alle die bloedjes ze slagen z'al dood. Zij wierden in hunder bloed gesmoord. Met trommels, trompetten en zoete geluid. Sheet Music from Adolphe Richard Lootens, Jean Marie Eusèbe Feys, eds., Chants populaires flamands: avec les airs notés, et poesies populaires diverses (Desclée, De Brouwer & Cie, 1879), #18, pp. 30-31. Sheet Music from Charles Hutchins, Carols Old and Carols New (Boston: Parish Choir, 1916), Carol #750. 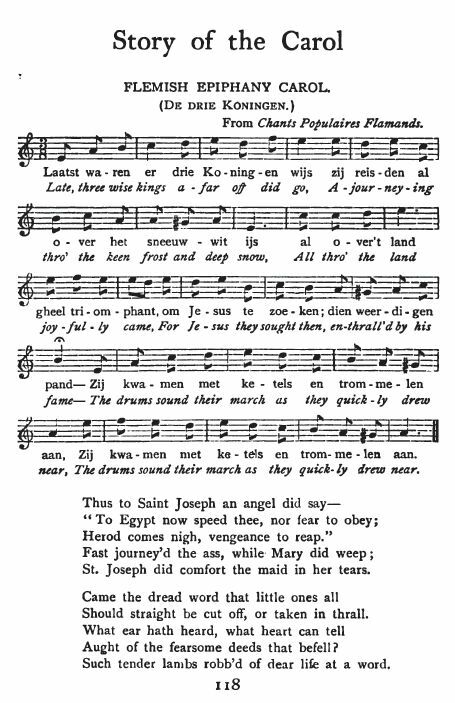 Sheet Music from Edmondstoune Duncan, The Story of the Carol (London: The Walter Scott Publishing Co., Ltd.; New York: Charles Scribner's Sons, 1911), p. 118. John La Montaine (1920-) , "The Magi and King Herod", published 1969 [soprano, alto, tenor, bass, narrator, piano or harp, timpani, and gong or cymbals], from Wonder Tidings. Martin Edward Fallas Shaw (1875-1958) , "Three Kings" [voice and piano], arrangement; in The Oxford Book of Carols (Oxford University Press, 1928), #80. 1. The Three Kings ("Late, three wise Kings afar off did go"); Translator unknown. 2. "Three kings are here, both wealthy and wise;" Translation by Robert Graves (1895-1985), Oxford Book of Carols (Oxford University Press, 1928, 1964). Because it is under copyright, this translation is not posted on this web site. 3. According to a post at the Mudcat Cafe, another copyrighted translation appears in A Book of Christmas Carols (Shekerjians, 1963), with the title "There were three kings, on journey did go." I haven't collected this translation, yet. Since it is under copyright, it would not be posted to the web site, either. "Three kings are here" was recorded by Artistan, a folk trio, in 1994; it is said to have been first released on their Christmas CD "Bygone Christmas," and is currently included on their CD "Christmas Is Come In." You can find a MIDI file, an MP3 file, and another piece of sheet music at "English Concertina."